Scholar and peace activist, David Cortright, and his co-authors, Conor Seyle and Kristen Wall, argue that a lack of institutional accountability and a trend toward right wing populism are jeopardizing peace in the United States and other countries in their new book, Governance for Peace: How Inclusive, Participatory and Accountable Institutions Promote Peace and Prosperity. The authors review research on the causes of armed conflict and the foundations of peace to conclude that the critical element contributing to peace is the capacity and effectiveness of governments—violent conflict is much less likely when governments are inclusive, participatory, and accountable to their citizens and provide a robust array of social services. If the premise the authors put forth is true, the people of Europe and the US should take a lesson from the political unrest and authoritarianism unfolding in Venezuela and Turkey. It was not long ago that leaders in both countries were swept into power on a wave of populism. However, over time those leaders consolidated power, became less accountable to those they govern, and in the case of Venezuela are now struggling to deliver basic services such as education and healthcare—resulting in varying degrees of political violence. Similar patterns appear to be developing across the world in countries as diverse as the Philippines, Hungary, and Poland. If these trends continue, the world may see an increase in conflict in the years to come. For more information please contact Jean-Pierre Larroque of One Earth Future at jplarroque@oneearthfuture.org. About One Earth Future: OEF is a self-funded, private operating foundation seeking to create a more peaceful world through collaborative, data-driven initiatives. We focus on enhancing maritime cooperation, creating sustainable jobs in fragile economies and our research actively contributes to thought leadership on global issues. 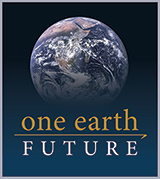 OEF Research: As One Earth Future’s think tank program focused on global peace and security, OEF Research conducts empirical research on the predictors of peace and on the role of good governance in building and sustaining peace. They share that research with scholars, policy makers and all interested in a more peaceful world through their published reports, discussion papers and educational forums.